Surface Mount Device Transistor (SMD Transistor) is an SMD electronic component made up of semiconductor material like silicon or germanium. 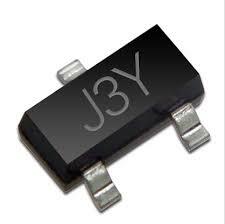 it is made by two diode.its also called double diode. 1. Ammeter (E) – Flows current on receipt of forward bias. Electrons are emitted in NPN transistors whereas PNP transistors emit ‘holes’. 2. Collector (C) – The terminal of the transistor which receives the emitted electrons or holes. Collector always works or reverse bias mode. 3. Base (B) – The layer between ammeter and collector is called base. Base displays the property of showing low resistance in ammeter junction forward bias and high in collector junction reverse bias. 2. Function: Switching, Amplification, Regulating Voltage ( AC to convert into DC). 3. Unit: Transistors are identified according to the code.